Horses have a very delicate digestive system. There are a number of treats you can give your horse that may be harmful. Here is a list that should help from Feed Your Horse Like a Horse book by Dr. Getty. Note: Even though there are fruits and veggies that are safe for horses, always only give in moderation. Slow on the Inside, Fast on the Outside: If you are warming up/cooling down, you are generally slower and therefore, should keep on the inside track. Riders that are working at a faster pace such as a canter or extended trot should stay on the outside track. Announce Your Intentions: Tell the other riders what you plan to do: “passing left”, “circle”, “jumping Oxer”, “cross poll”, “trot polls”, etc..
No Lunging in Riding Arena: Do not lunge your horse in the riding arena while people are riding. It is best to use another arena or a specified lunging arena if your barn has one. Mount/Dismount Out of the Way: When you hop on and off make sure you are out of the way of any other riders. Cue Quietly: Voice commands should be done quietly. Try Not to Interrupt Lessons: Try to ride at times when a lesson is not taking place in the arena, or use another arena in order to avoid interrupting a lesson. Take Care When Using your Whip: Do not touch or frighten other horses with it, ever. Stay Observant While Riding: Do not distract yourself with texting on your phone, listening to music while riding in order to hear and see your surroundings. Keep A Horse Length Away: Don’t crowd other riders and keep at least a horse’s length between you and the horse in front of you. No Smoking: Do not smoke while riding, or in an arena or stable. It is a hazard to other riders and the horses. No Loose Horse: Never turn your horse loose in an arena while people are riding. Close the Gate Behind You: Aways keep all doors or gates closed as to avoid horses bolting out in case there is an incident. Be Respectful: Try to always give way, and keep in mind others maybe beginners, or riding green horses. Always Ride Safe: Wear a helmet and proper boots. Keep these in mind whilst riding, whether at home or at a show, in order to avoid any incidents. 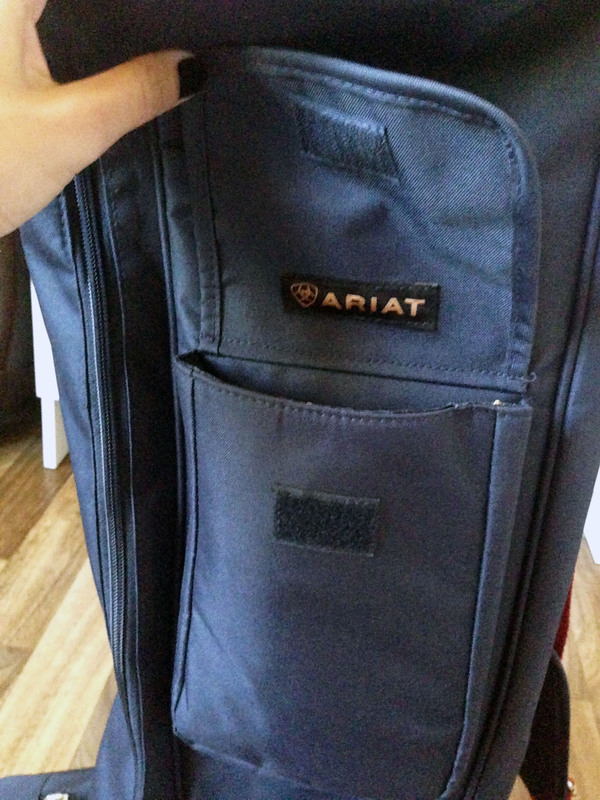 In my older post, (Maintaining Your Riding Boots), I mention that I have been using the Ariat Tall Boot Bag , which I purchased from Equestrian Collections, to store my Franco Tucci tall boots. You can purchase these locally in the UAE from Gulf Rider (al Awani), in Abu Dhabi Khalideya or their store in Dubai, Khawaneej. They only have the black/tan in stock though, which is why I purchased mine from Equestrian Collections. 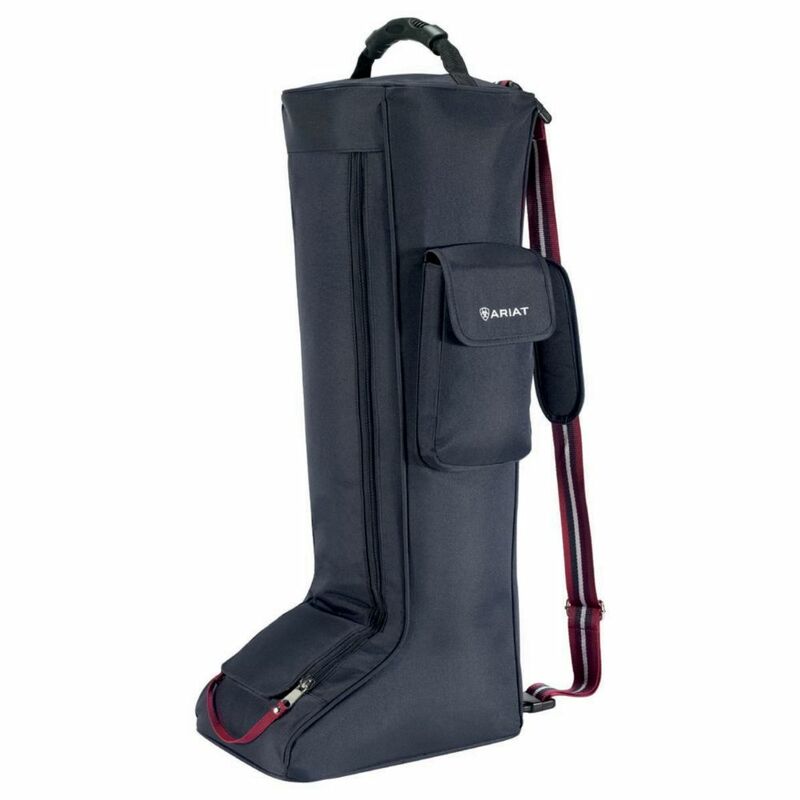 The Ariat® Tall Boot Bag is a stylish tall boot bag that permits convenient transport and protection of your boots. What better way to transport your boots than in style? 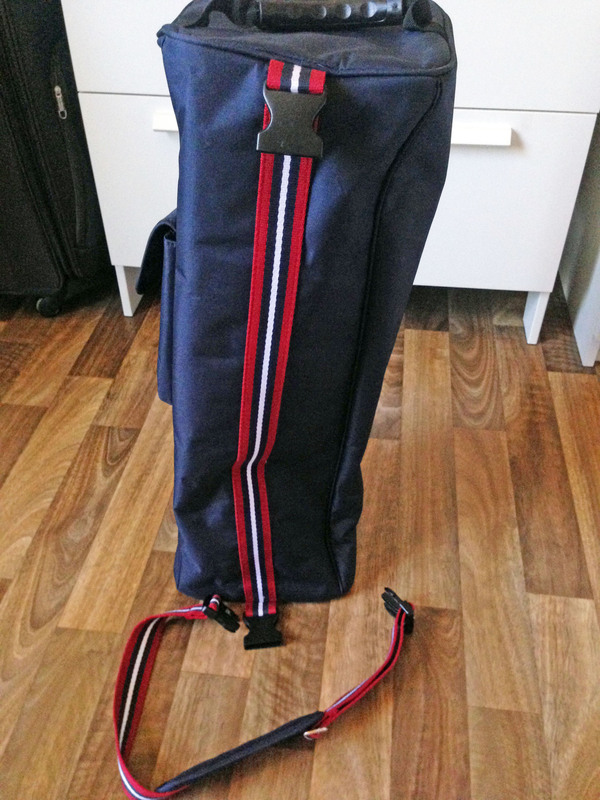 This navy and red bag is made of durable polyester canvas. 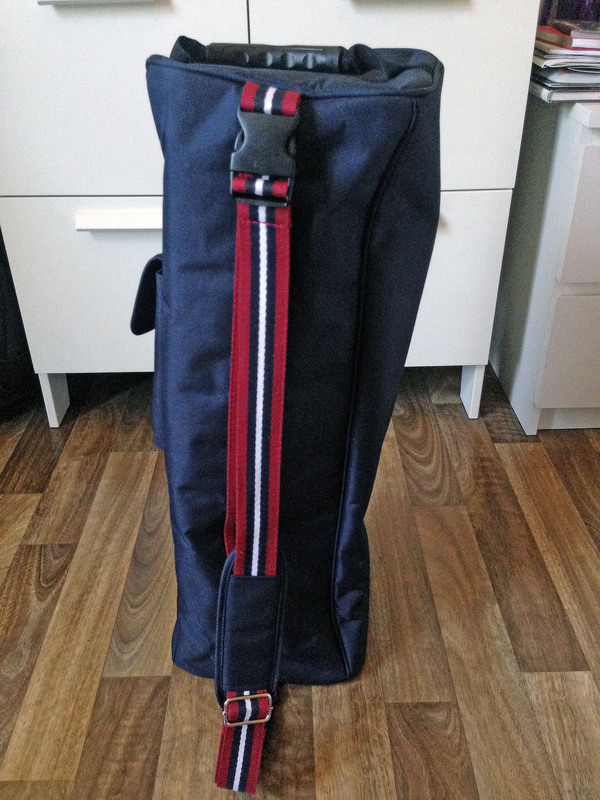 It is further equipped with sturdy and stylish webbing handles, an outside pocket and an inner boot divider. 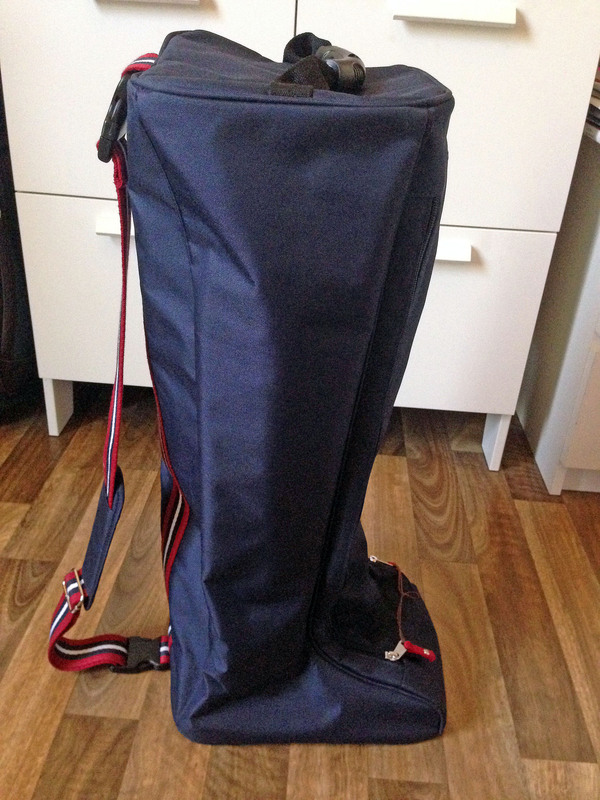 Size: 25.5″ H x 11.5″ W x 9″ D.
This isn’t important, it only makes it quicker and easier to open the bag. 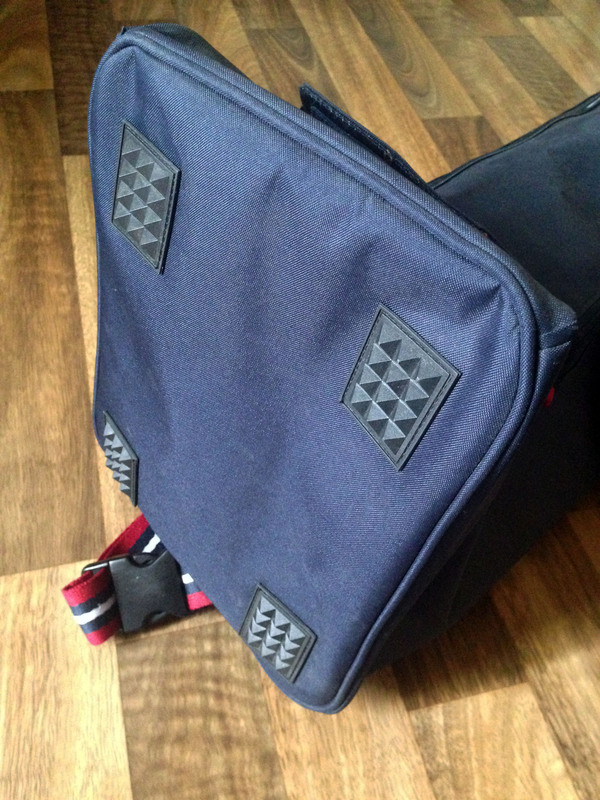 It does have velcro closure as you can see above in order to avoid any dust going into the bag while storing. There is an outside pocket that is big enough to fit some spurs, gloves, hair net and phone, that is also enclosed with a velcro tab. Personally, I would prefer a zipper for the pockets in order to avoid anything from falling out. 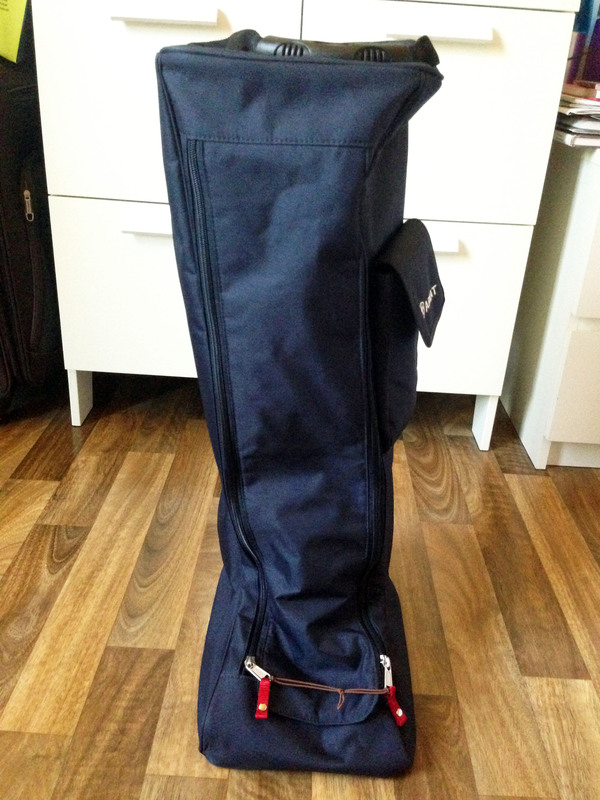 The bag also has a very convenient adjustable shoulder strap which makes it a lot easier to carry with you. 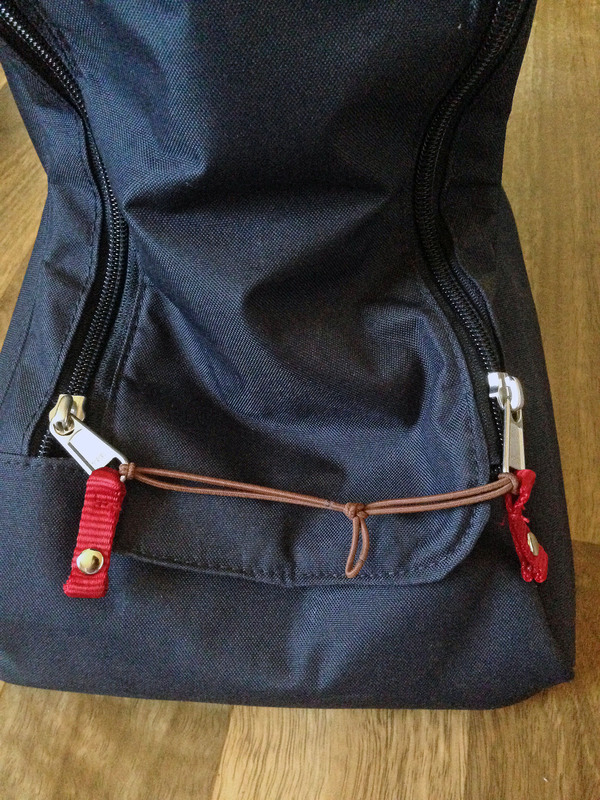 The shoulder strap is detachable if you prefer to remove it, you may do so easily with the buckles. 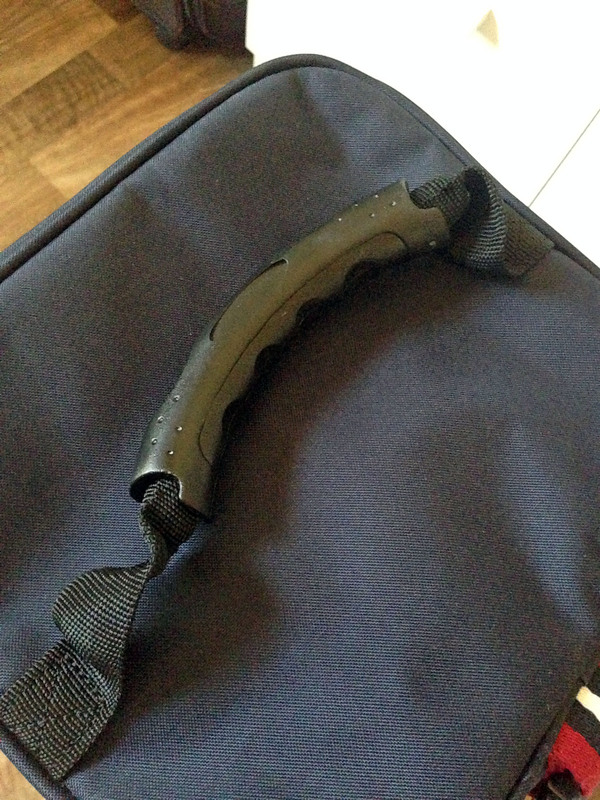 On top, you have the ergonomic handles which are tough, durable, and easier to hold than normal webbed handles. 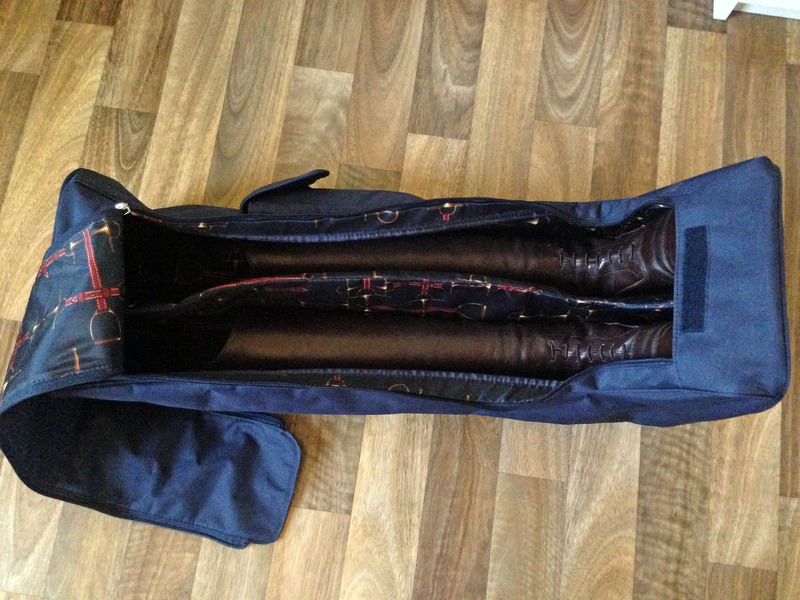 On the inside, there is a beautiful silky soft lining with boot dividers, which avoid the rubbing of your boots during transportation and storage. 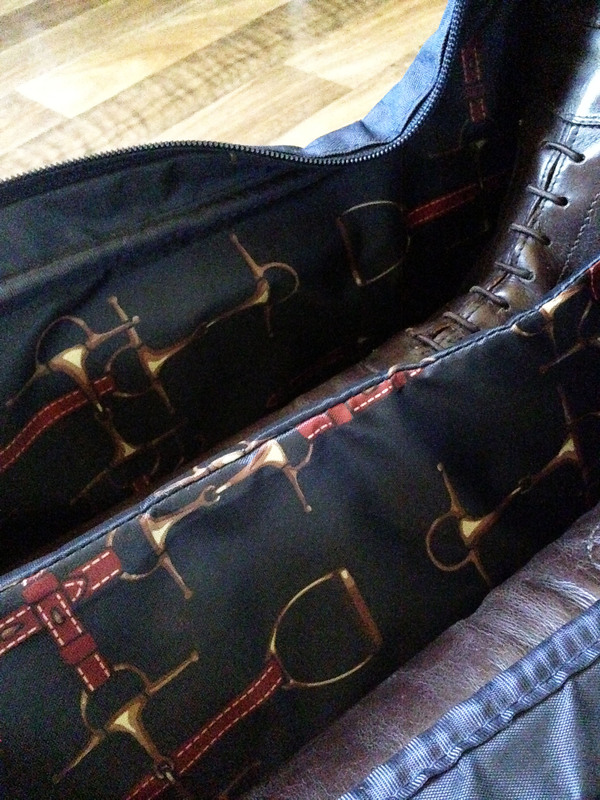 It has a bit/stirrup design which gives it a luxury feel. 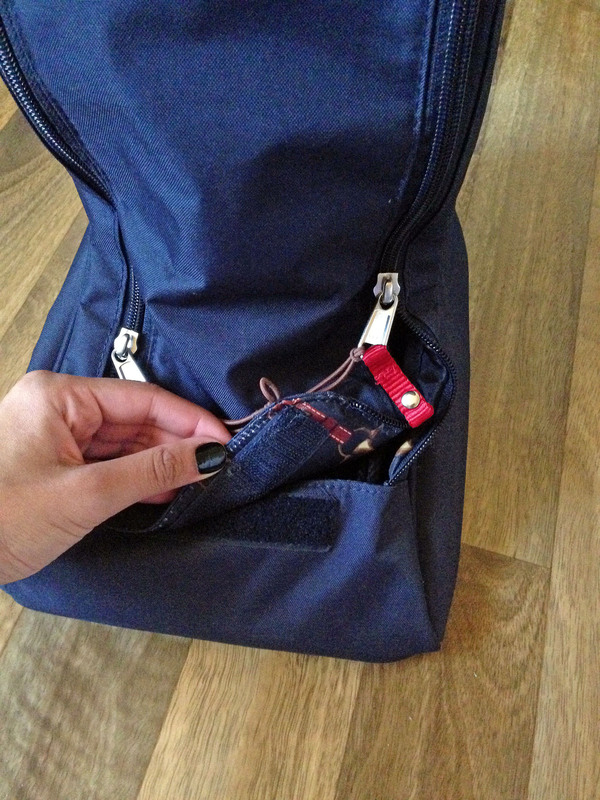 The dividers are attached by velcro, therefore, can be removed, which makes it easier for cleaning the boot bag. Finally, the bottom has four raised corners to avoid the material from getting dirty while upright, as well as providing grip. Verdict: I really like this bag and would recommend it as it is has inner boot dividers which I find important in order to avoid rubbing. It is tough, easy to carry around, and easy to clean. 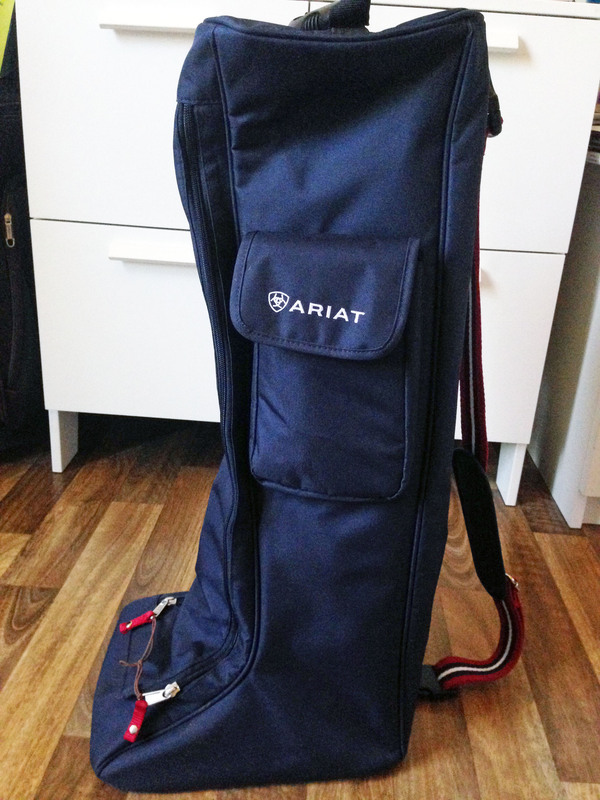 It also matches the rest of the ariat bag collections too if one wishes to buy the set. 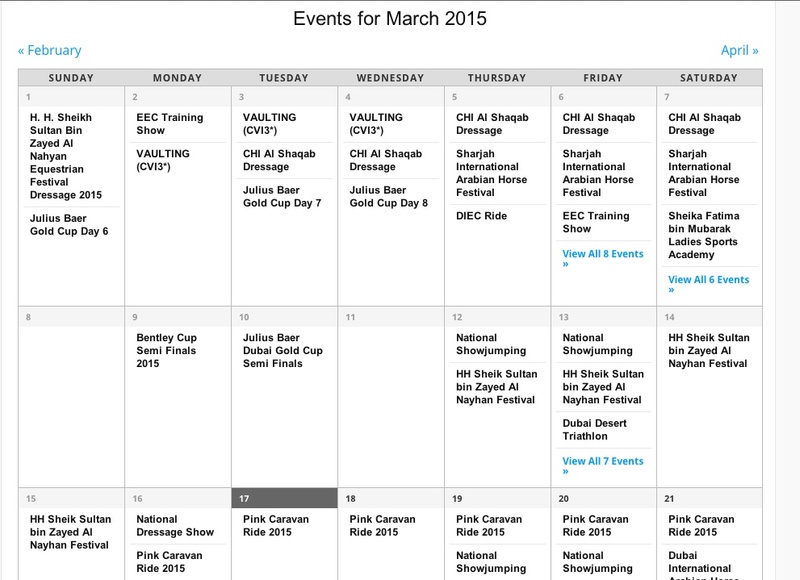 The UAE’s Emirates Equestrian Federation does have an official events calendar, however, it does not include unaffiliated shows, or clinics. 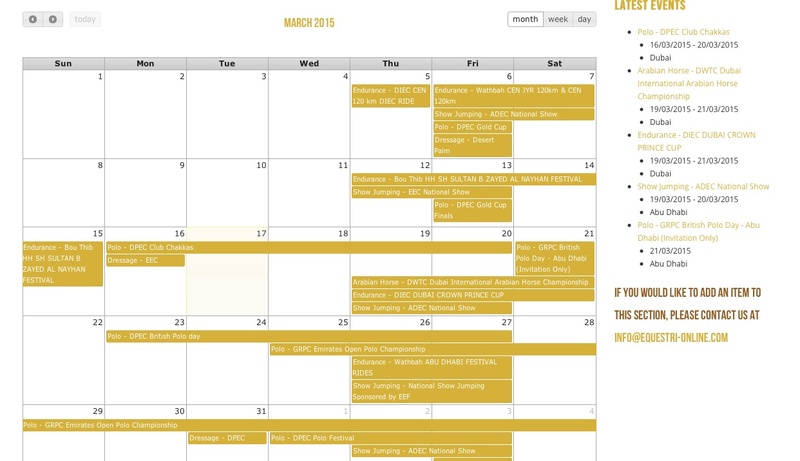 A good way to stay up to date or plan your shows is to take a look at eQuestri’s calendar which includes national, international, training shows as well as clinics. They also have a directory for Equine Services, Farrier Services, Riding Schools, Livery Yards, Veterinary and Dentistry Services. You may also wish to take a look at Horse-UAE, who also have an up-to-date list of Events and Directories. MARE – Adult female horse (3 years and older). GELDING – Castrated adult male horse (3 years and older). STALLION – Uncastrated adult male horse (3 years and older). PONY – A full-grown small horse (14.2 hands and under). DAM – The term give to a female horse when she becomes a mother. SIRE – The term given to a stallion when he becomes a father. FOAL – A newborn baby horse (before weaning). WEANLING – A colt or filly who is 6 to 12 months old. YEARLING – A horse who is between 1 and 2 years old. COLT – Male horse (3 years old and under). FILLY – Female horse (3 years old and under). CONFORMATION – The shape of a horse’s body. A horse with good conformation is stronger and more likely to stay sound than one with weak conformation. HAND – Measures how tall a horse is (one hand = four inches). LAME – A “lame horse” has an injury that interferes with his performance and/or health. SOUND – A “sound horse” does not have any injuries that interfere with his performance and/or health. POINTS – This word is used when describing the color of a horse. The “points” of a horse are his mane, tail, lower legs and the tips of his ears. GAIT – The different speeds a horse can travel. Every horse has 4 natural “gaits”, the (1) walk (2) trot (3) canter (4) gallop. WALK: A slow four-beat gait. TROT: Moderate-speed gait in which the horse moves from one diagonal pair of legs to the other, with a period of suspension in between. CANTER: Three-beated gait of the horse in which one hind leg strides first (the leading leg), followed by the opposite diagonal pair and finally the opposite foreleg. Called the lope in Western riding. AIDS: Signals or cues by which the rider communicates his wishes to the horse. The “natural” aids include the voice, the legs, the hands, and weight. “Artificial” aids include the whip and spurs. CAVELLETTI: Adjustable low wooden jumps used in the schooling of horse and rider. COLLECTED: Controlled gait: a correct coordinated action. COLLECTION: Where the rider, by means of carefully balanced driving and restraining aids, causes the horse’s frame to become compacted and the horse light and supple in the hand. The baseline is shortened, the croup is lowered, the shoulder is raised and the head is held on the vertical. COMBINED TRAINING: Equestrian competition held over one or three days and including the disciplines of dressage, cross country, and show jumping. Also known as Eventing. 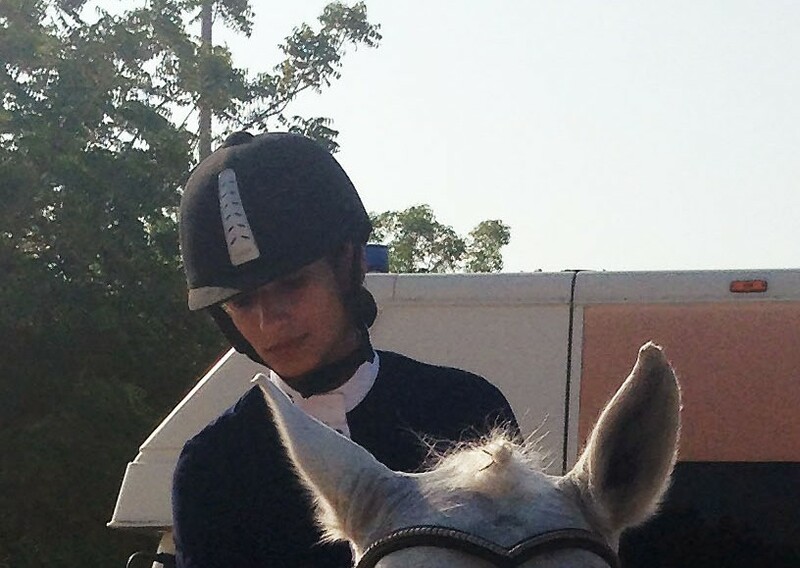 EQUITATION: The art of horse riding. EXTENSION: The extension of the paces is the lengthening of the frame and stride. The opposite ofcollection. FLYING CHANGE: Change of canter lead performed by the horse to rebalance during turns and changes of direction. HALF HALT: An exercise, basically a “pay attention, please” used to communicate to the horse that the rider is about to ask for some change of direction or gait, or other exercise or movement. HALF PASS: Dressage movement performed on two tracks in which the horse moves sideways and forwards at the same time. ON THE BIT A horse is said to be “on the bit” when he carries his head in a near vertical position and he is calmly accepting the rider’s contact on the reins. OVERREACHING: Faulty gait in which the hind foot steps on the heel of the front foot on the same side. Occurs most often when the horse is galloping or jumping. PASSAGE: Dressage movement in which the horse trots in an extremely collected and animated manner. PIAFFE: Dressage movement in which the horse trots in place, with forehand elevated and croup lowered. PIROUETTE: Dressage movement in which the forelegs of the horse describe a small circle, while the hind legs remain in place, one of them acting as a pivot. REIN BACK: When a horse moves backward with the hooves being set down almost simultaneously in diagonal pairs. REINING: Type of Western riding in which advanced movements such as spins and slides are executed in various patterns. REVERSE: A command used in the show ring to indicate a change of direction. SERPENTINE: School movement in which the horse, at any pace, moves down the center of the school in a series of equal-sized loops. SHOULDER-IN: Two-track movement in which the horse is evenly bent along the length of its spine away from the direction in which it is moving. WARMING-UP: The process of going through the gaits while performing suppling exercises to limber up both horse and rider in the beginning of a workout. LUNGING – A way of exercising a horse, using a lunge line that is attached to the horse’s halter. The horse moves in circles around the trainer, who stands in the middle holding the lunge line. LUNGE LINE – A very long rein (about 20-40 feet) used to lunge a horse. 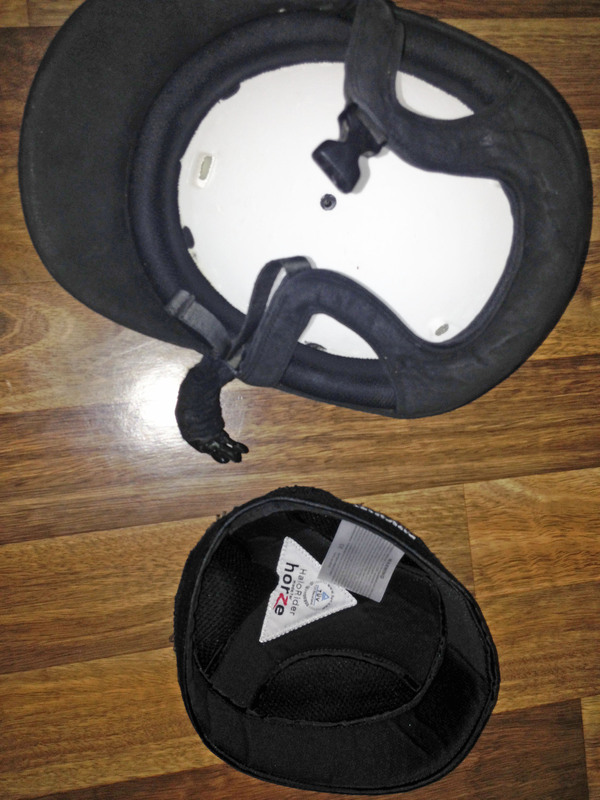 With my small head, it is very difficult for me to find a helmet that fits and suits my face structure. I have tried the KEP Italia, Samshield, GPA Speed Air, and none of them seem to fit me, as much as I wish they would. 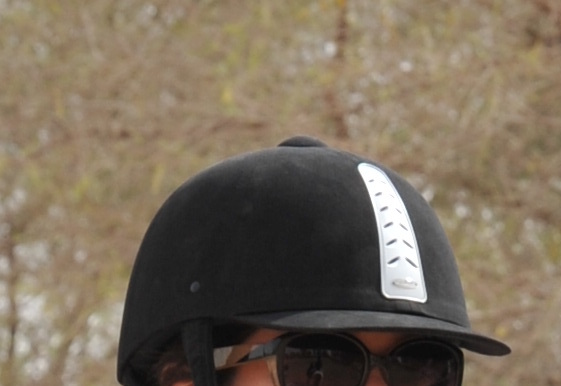 Nevertheless, I came across the Horze HaloRider Helmet a few years ago from DubaiPetFood. I purchased the black and silver model, in size 56. 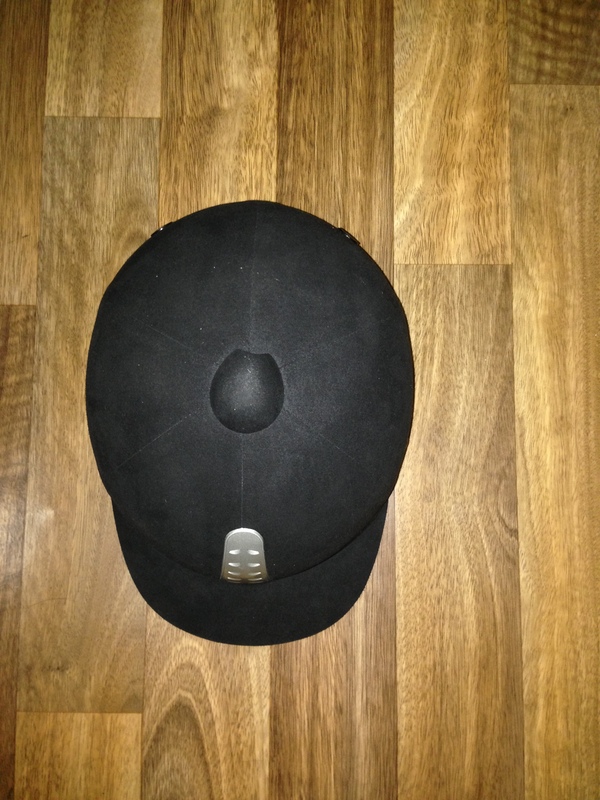 Well-fitting everyday riding helmet from Horze. Cover in water- and dirt-resistant microfibre textile. Ventilation at both front and back to decrease humidity, while the soft shield reduces risk of injury. Ventilation both front and back. Adjustable and padded chin strap for better fit. The helmet is very simple and elegant. It has front vents, as well as back ones which does create decent airflow. 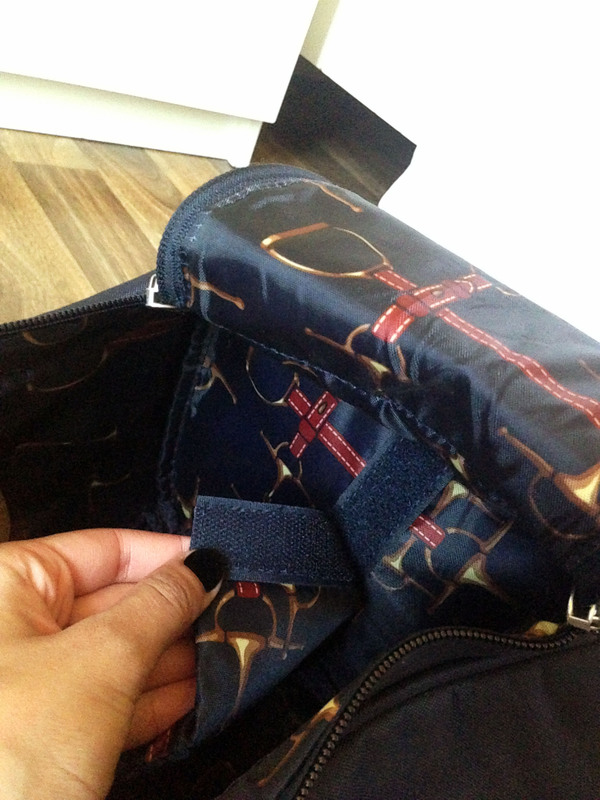 The lining can be removed, thus, making it easy to place in the washing machine. That being said, it does flatten over time, as with all helmets. The microfiber textile is easy to clean using either a microfiber cleaning spray, or simply a wet cloth. It also comes with a soft cloth string bag, which is convenient as it does not take up much space, even though I would have personally preferred a harder bag for more protection while traveling. It is not only light on the head, but also comfortable. However, the helmet strap does look very squarish, which reduces the appealing appearance of the helmet in my humble opinion (as seen below). Even though it does state that it dirt-resistant, it falls short of that statement as the weather here in the Middle East is full of dust and sand particles, thus, allowing the helmet pick it up quickly. 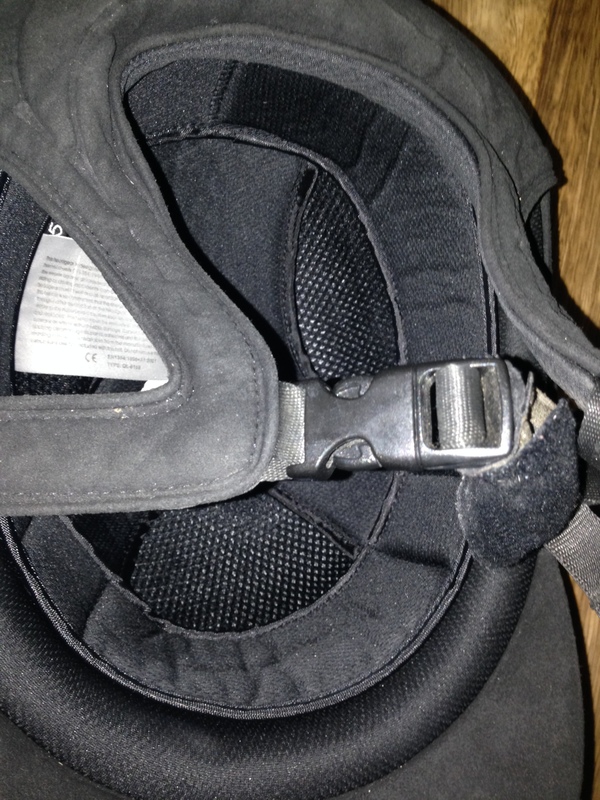 As mentioned above, I got this helmet around 3.5 years ago, without really knowing how to fit a helmet. I found out that it was too big on me when we started jumping as it kept falling before my eyes, therefore, I purchased another HaloRider Helmet, only this time, I got 2 sizes down (54), from Horse World last year. 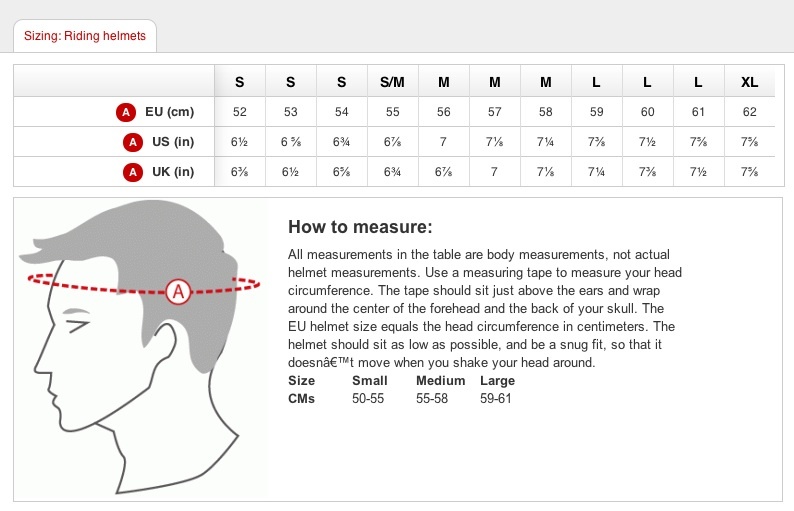 In order to prevent the purchase of helmets that do not fit as should be, you can find out the proper way on How to Measure Your Head for a Helmet from the Dover Equestrian Library. 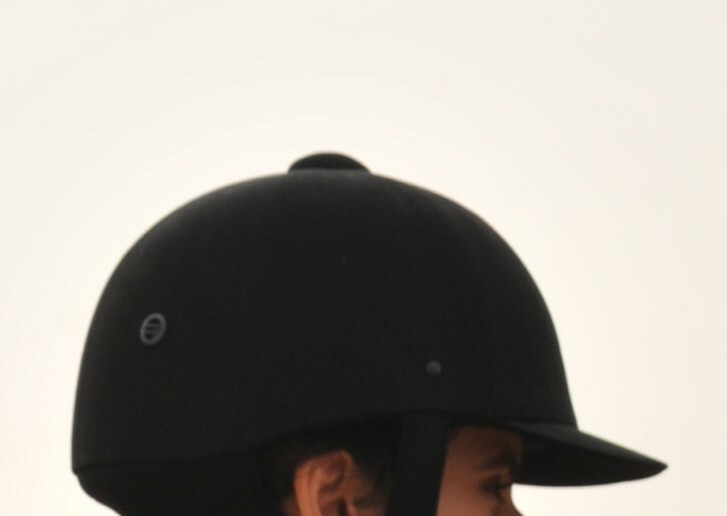 Verdict: I would definitely recommend this helmet for schooling and the occasional competitions, especially for those that find difficult to find a helmet, as it is affordable and provides decent protection. HOWEVER, I would suggest investing in a more protective helmet if you do compete often. Safety first! 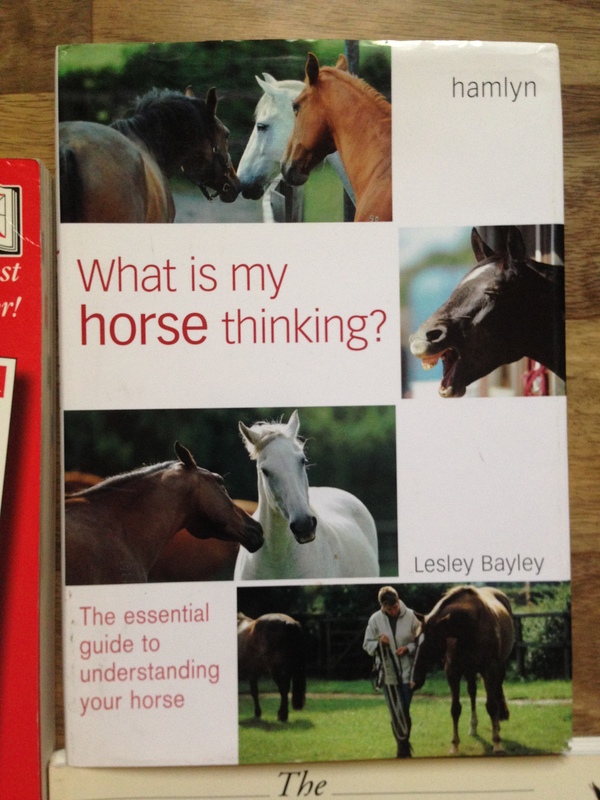 Being around horses, you do learn a lot, nonetheless, books offer a more advanced knowledge on a number of topics. 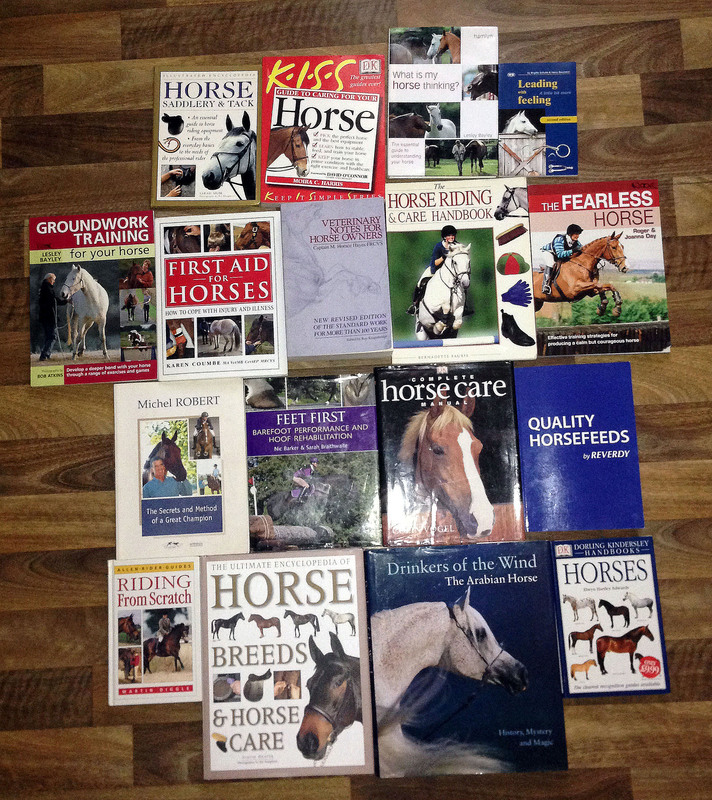 I have a collection of 17 horse related books, which I have either brought, or was gifted. I thought it may be time to do a collection and overview of the books, hopefully, giving you an idea of which book would be suitable for a specific subject you are interested in. As mentioned above, some I brought myself, and some were gifted, therefore, I cannot list the store they were brought in, thus, I will link them all to Amazon, however, you will find a number of them in Kinokuniya (Dubai Mall), and Borders (City Center), and maybe even Virgin Megastore. 1. 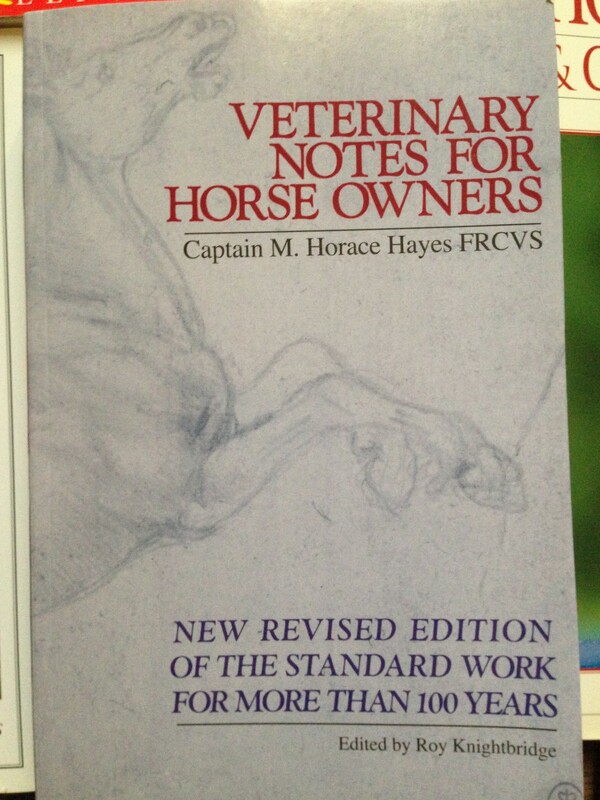 Veterinary Notes for Horse Owners: A comprehensive manual of horse medicine and surgery, this book explains the symptoms and treatment of every disease or injury that the horse owner is likely to encounter. Written in a straightforward manner that will appeal to both novices and experts, the book contains detailed sections on the organ systems, the musculoskeletal system, the reproductive system, infectious diseases, medical and surgical advances, management and husbandry, exercise physiology, the purchase of horses, legal and medical certification, and on the veterinary service itself. There are sections, too, on nutrition, determination of age, proprietary medicines, prohibited substances and notifiable diseases, and this latest revised edition has entirely new illustrations and photographs. 2. The Secrets and Methods of a Great Champion: A new approach to equitation through a quest for harmony and complicity with the horse. 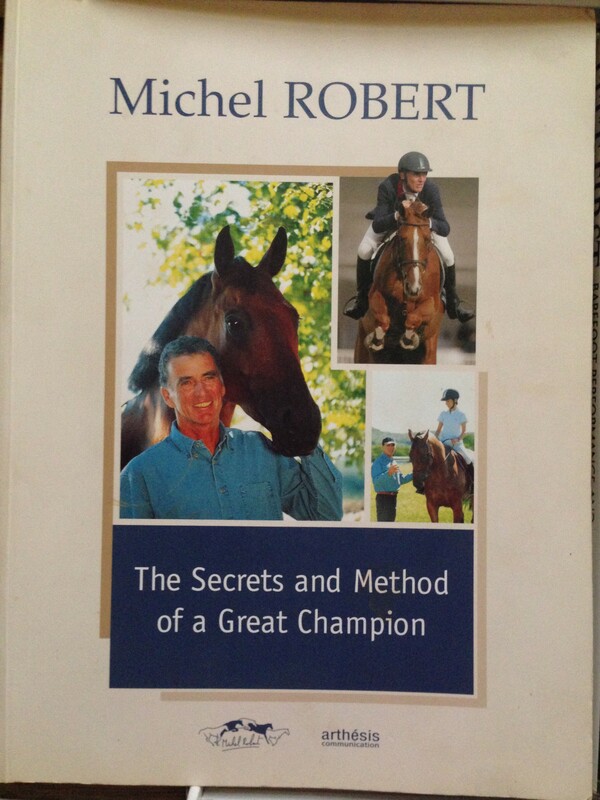 Michel devotes most of his book to the rider s mental preparation: attitudes, behaviour, the way one acts and thinks… moving beyond technique with a positive and open mind. A process that favours being honest with oneself, with others and with horses. In this spirit, explore his method based on using wide-angle vision: The physical preparation of both horse and rider, Preparing to jump by working on the flat: having the horse on the bit, a straight horse, one that bends, flying changes, reining back… Working over fences with the approach, the strides… Ideas for training exercises, And his precious advice for being at one s best one competing, both mentally and physically. 3. 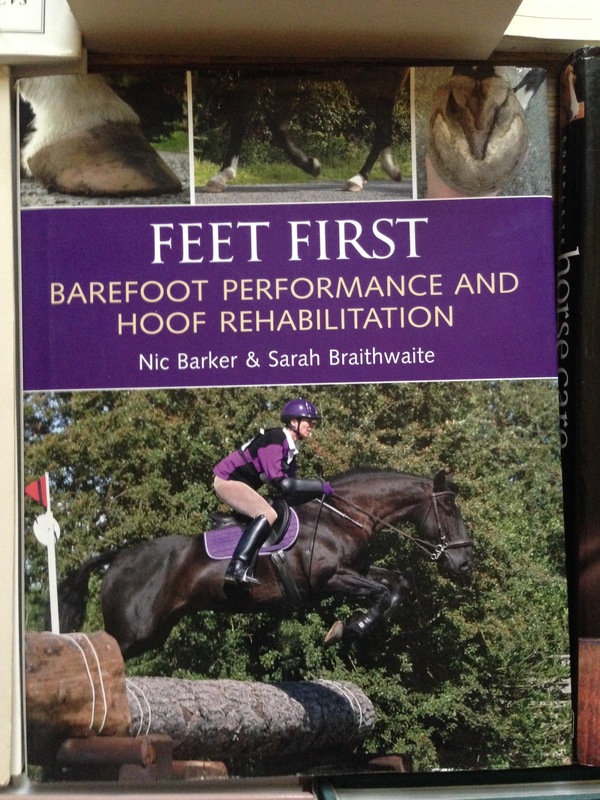 FEET FIRST: Barefoot Performance and Hoof Rehabilitation: This ground-breaking book explores the issues surrounding barefoot horses in the UK and looks in detail at how to improve overall hoof health, in both shod and barefoot horses. The book offers a practical, hands-on advice on achieving barefoot performance in a variety of disciplines – from eventing and hunting to endurance – focussing on the essential elements for healthy hooves: diet, environment, exercise and trimming or shoeing. In addition, the book has step-by step advice on rehabilitating problem hooves with case studies of horses with a range of issues, from navicular or tendon damage to metabolic disorders like laminitis and insulin resistance. The authors have successfully ridden and competed their own horses barefoot for many years and have helped many hundreds of their clients’ horses work successfully without shoes. 4. Groundwork Training for Your Horse: Designed to help develop a bond between the horse and the trainer which leads to greater trust and the ability to get the most from the relationship. This book includes step-by-step guides on how to improve the horse’s suppleness obedience and education from the groundwork level. It teaches the trainer how to tune in to the subtle body language of the horse and communicate with it in a much clearer way. 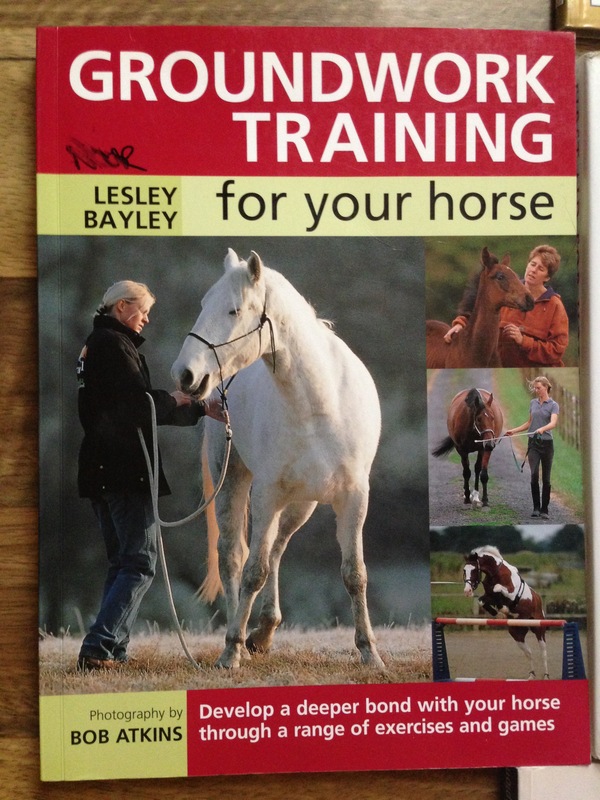 It also contains techniques developed and applied by top trainers and equine behaviourists. 5. 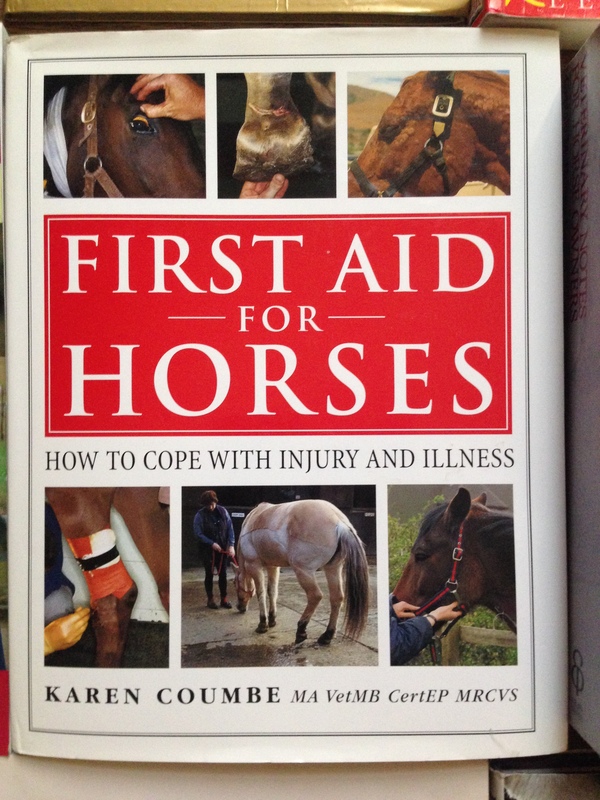 First Aid for Horses: How to Cope with Injury and Illness: All common ailments and accidents are covered in a quick-to-reference format with profuse illustrations and clear advice on how to cope and when to call the vet. Written by a leading veterinary surgeon and regular contributor to Horse & Hound this is the essential emergency handbook for every horse owner. 6. 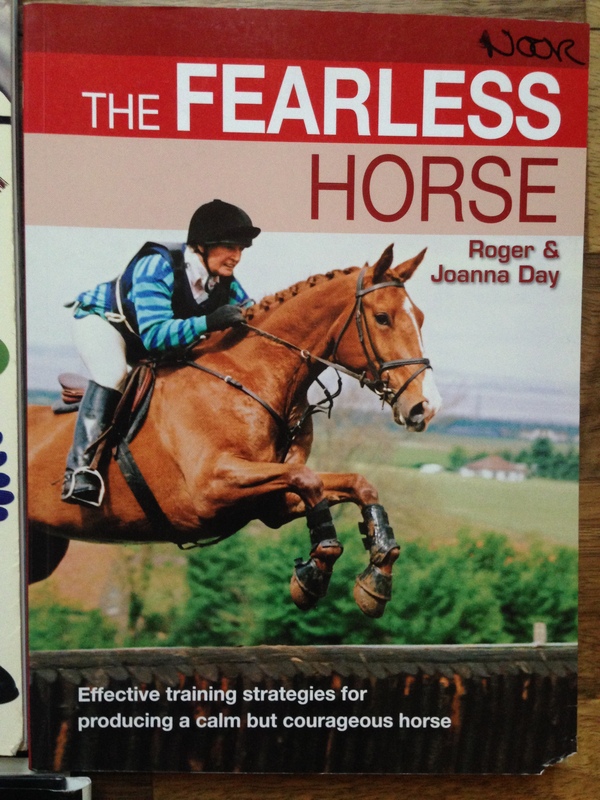 The Fearless Horse: Bridging the gap between natural horsemanship and competitive riding, this book offers an effective training programme for all riders, especially those who want to compete and succeed, for creating a calm, gentle and happy horse whatever the situation. It shows how to use the horse’s natural behavioural instincts to train with respect and kindness, and resolves stage-fright in an otherwise talented horse, and makes riding safer by ‘spookbusting’ your horse. 7. 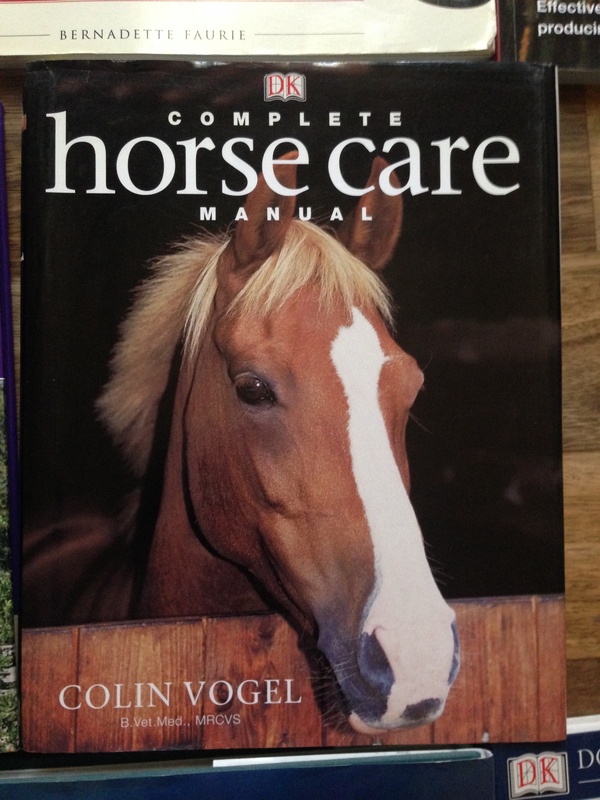 Complete Horse Care Manual: Comprehensive, fully illustrated and up-to-date, Complete Horse Care Manual is a thoroughbred guide to horse care. 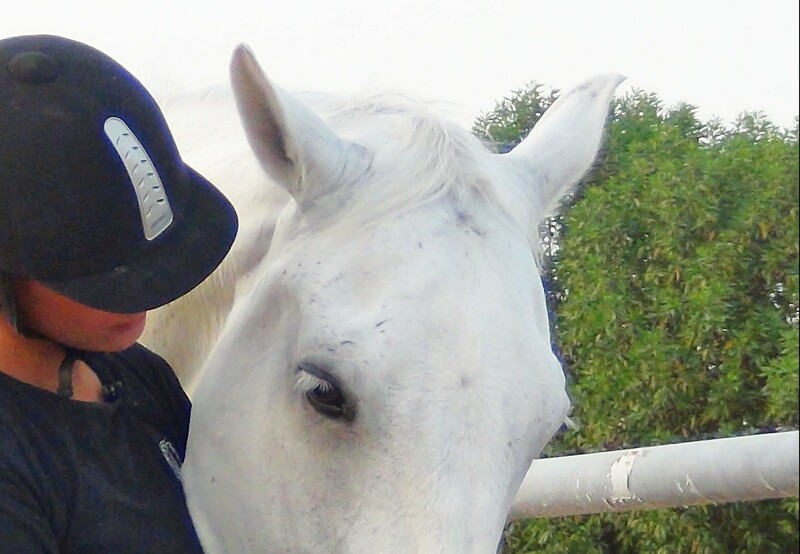 An excellent working relationship with your horse is based on understanding and communication. These lie at the heart of this practical guide. From day-to-day upkeep, stabling, and grooming, to nursing a sick horse and first-aid techniques, this accessible handbook will appeal to all horse lovers. 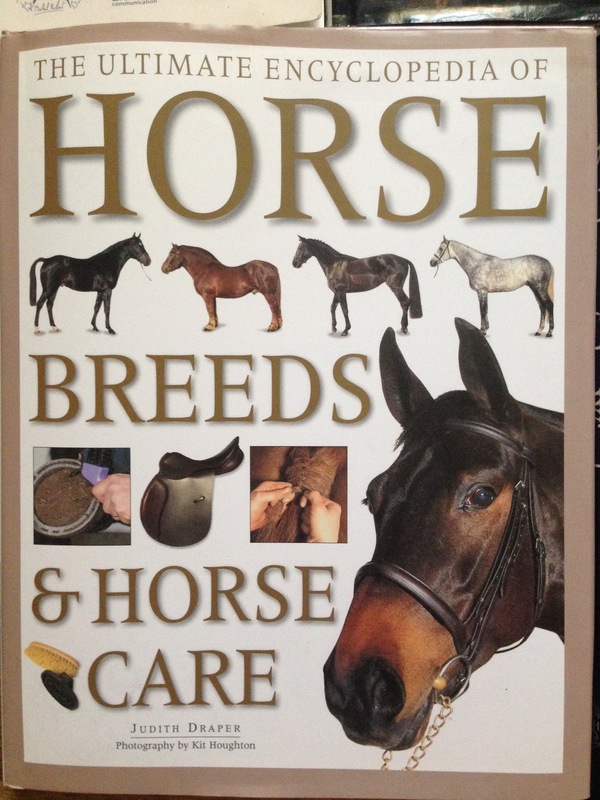 With over 650 specially commissioned photographs and diagrams, step-by-step sequences tell you all you need to know about caring for your horse. A detailed guide to ailments allows you to recognize common problems and deal with them efficiently. Practical suggestions for daily, monthly, and annual routines will ensure you keep your horse healthy and comfortable throughout the year. 8. What Is My Horse Thinking? The Essential Guide to Understanding Your Horse: Why does your horse try to bite you when you saddle up? Why does he take off the moment your seat hits the saddle? When your beautiful animal bucks suddenly or gallops wildly, curls his lip or shakes his head–understand the reasons why and how to provide the practical care he needs! Get into the equine mind with the help of a horse therapist who was also the award-winning editor of a bestselling equestrian magazine. Whether your horse is in the field or barn; training, riding, or traveling; or even feeling ill, you’ll feel confident interpreting every aspect of his behavior and motivations. The many fabulous color photographs vividly reveal horses’ expressions close up, and show them socializing, raising their foals, “asking” you to stand still, reacting to their surroundings and company, and more. 9. 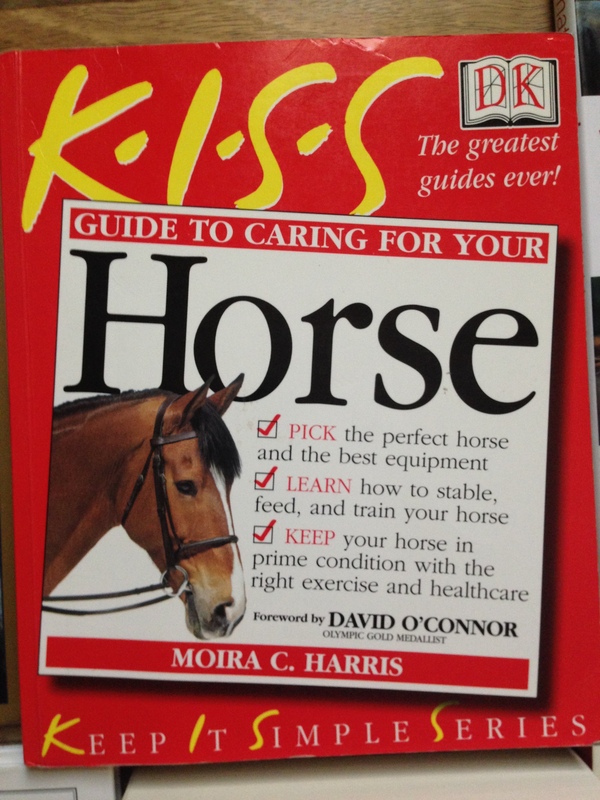 Guide to Caring for Your Horse: Covering every aspect of horse care from grooming, exercise and routine maintenance to selecting riding gear and finding the right housing for your horse — KISS Guide to Horses is packed with insider’s tips on equine health and first aid, as well as advice on how to tackle training and competition. 10. The Ultimate Encyclopedia of Horse breeds & Horse Care: This indispensable book brings together in one volume a comprehensive reference to the world’s main horse breeds and a practical care guide for all horse and pony owners. The first half of the book introduces a round-up of horses and ponies from all over the world, offering a visually stunning guide to the main breeds. 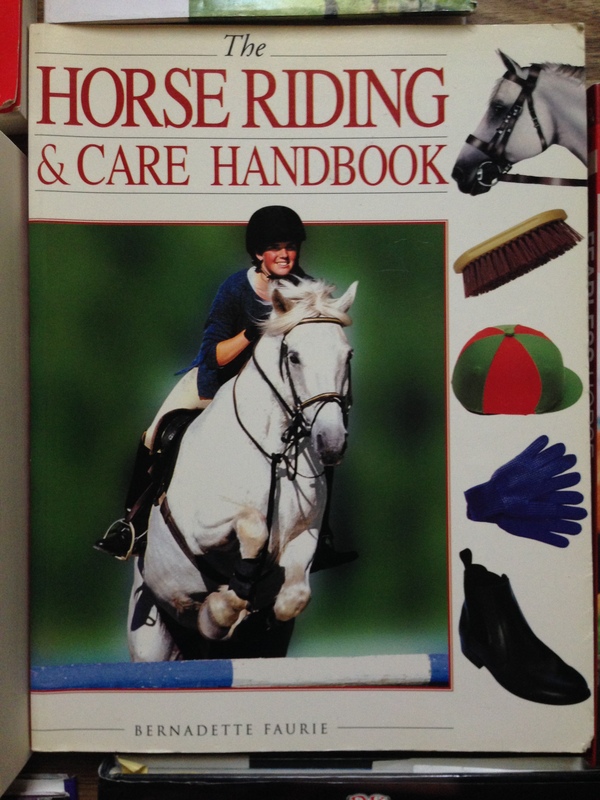 The second part of the book opens with advice on buying, bearing in mind riding ability, time available for care and exercise and, most importantly, what activity you hope to pursue—showing, dressage, driving or just riding for fun. 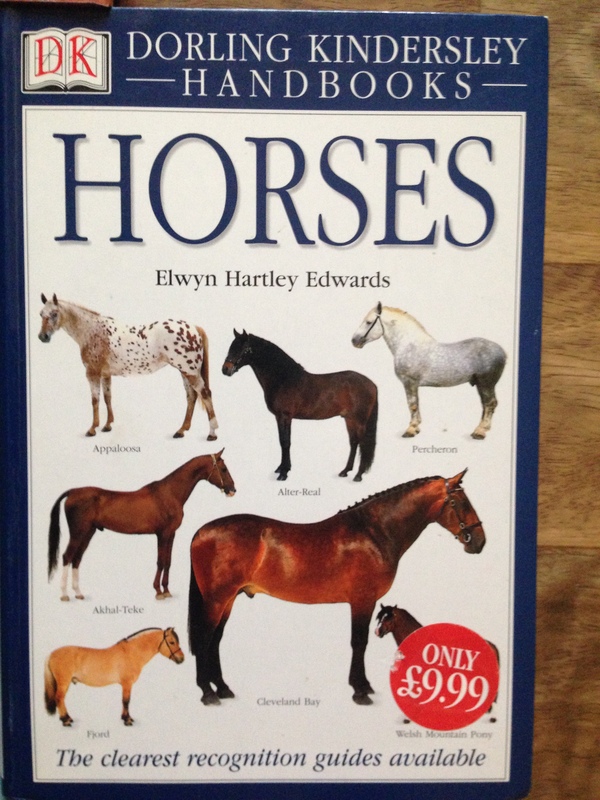 In the following chapters, you’ll find expert advice on: Different systems for keeping a horse; all aspects of stable management; bedding, feeding, and watering information; necessary exercise; grooming, including braiding, clipping, shoeing and tack; health and basic first aid; and more! 11. The Horse Riding & Care Handbook: The Horse Riding & Care Handbook is filled with advice and information that will be of use and interest to both the novice enthusiast and the experienced rider. Beginning riders will learn what equipment is necessary for both the horse (bridles, bits, and saddles) and rider (hats, gloves, and boots), and what to look for in a riding school and riding instructor. Intermediate riders will learn how to move from the confines of the school into open-country riding (hills, riding through water, long-distance riding, and handling falls). For the most advanced rider, there is thorough information on competitive riding, including dressage, show jumping, eventing, and endurance riding. 12. 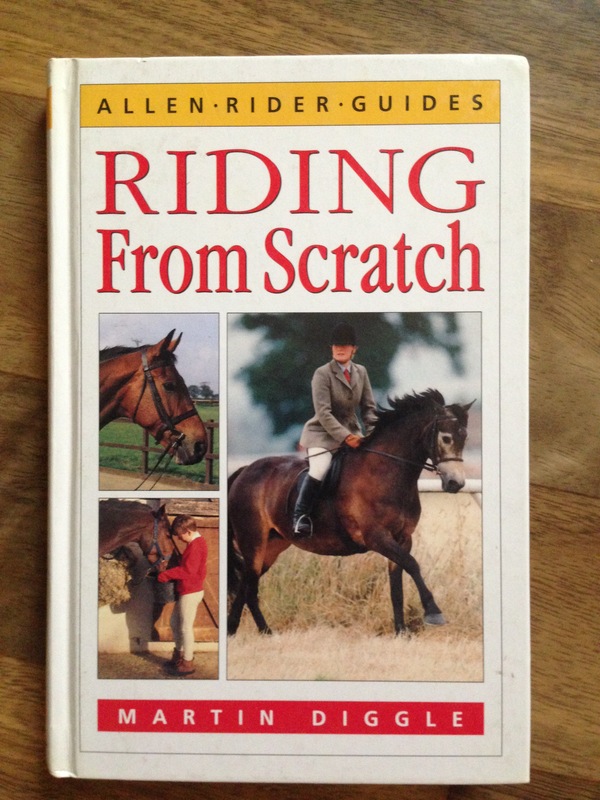 Riding from Scratch: A riding book for the beginner who wants to learn to ride. The author explains why novice riders should take pains to learn properly, introduces the horse as an animal rather than a machine, examines basic handling and saddelry and discusses the key principles and techniques of riding. This is the first in the “Rider Guides” series, which is intended to be a practical aid for all riders, whatever their standard. Each book concentrates on training the rider and on giving practical assistance to the rider who may be riding a variety of horses. 13. 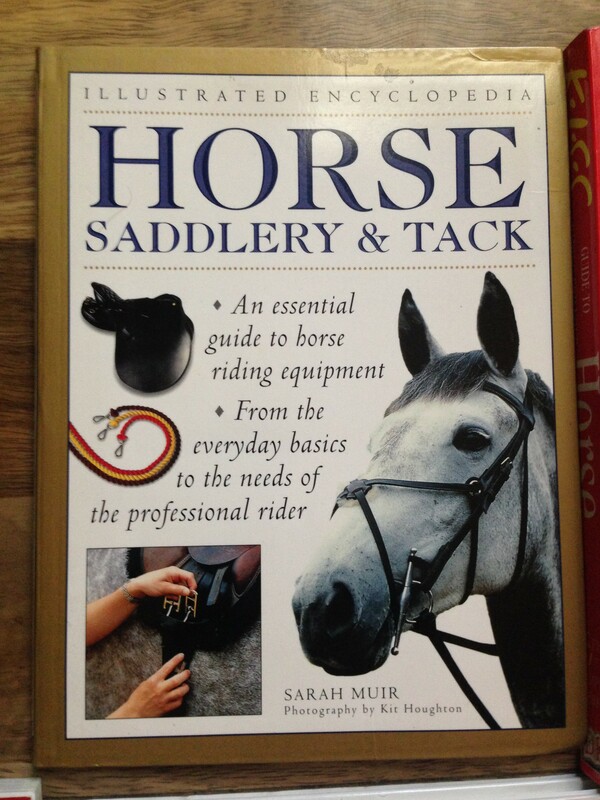 Horse Saddlery & Tack: This handy guide provides a comprehensive reference to tack and horse clothing, and considers general and specialized pieces of equipment in all areas of horsemanship for riders at all levels. 14. Horses (DK handbooks): The Dorling Kindersley Handbooks are the most visually appealing guides on the natural world in the book marketplace. Featuring more than 500 full-color illustrations and photographs, along with detailed annotations, Dorling Kindersley Handbooks make identification easy and accurate. 15. 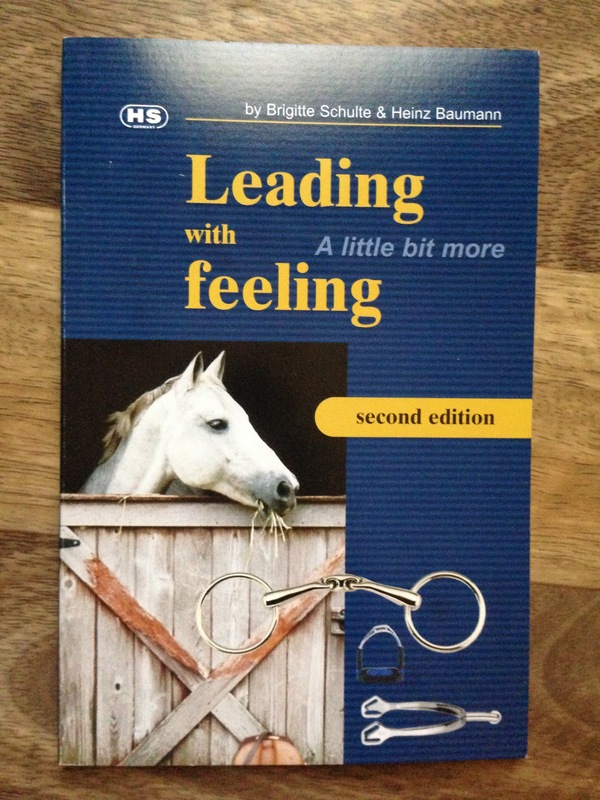 Leading with a Little Bit More Feeling: The booklet shows a whole variety of bits, stirrups, and spurs which have one thing in common: they are made of the finest materials available and were all designed to give the best possible feeling and comfort for both horse and rider. Leading with feeling. 16. 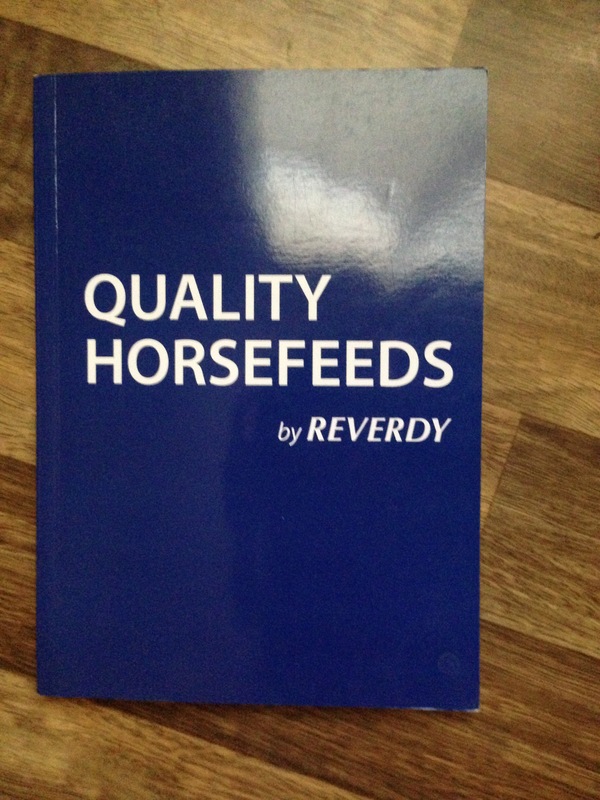 Quality Horsefeeds by Reverdy: Besides presenting Reverdy feed range, you will find information on the physiology of the horse, and the nutriments essential for covering their needs. 17. 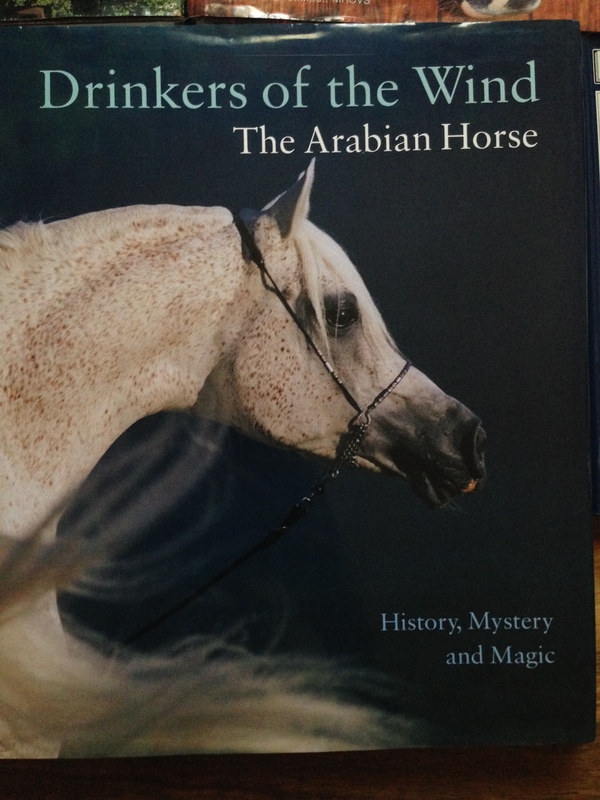 Drinkers of the Wind-The Arabian Horse: The almost spiritual relationship between the Arab and his horse and the long-standing fascination the world over for this purest-bred of all animals who serve humanity lie at the core of this work. Tracing the history of the Arabian (or Arab) horse from before the time of King Solomon to the present day, the text by Peter Upton – author, artist and internationally recognized expert on the subject – explains the true origins of the breed and its role in Arab history. At the heart of the book are photographs of the horses themselves, arranged by geographical area. A comprehensive list of Arab horse organizations, registries and societies and a glossary of Arabic terms are included.